This is my seventeenth growth report on OliverKenyon.com. I use these reports to share my progress updates from both a business and a personal point of view. You can view my previous reports here. Anyway, we’ll get into that later in the post, but first let’s deal with November. As ever, it was a busy month. In fact, it was so busy that I had my first battle with “stress” in a long while, which resulted in a visit to the doctor, but eh! This was mostly instigated by taking on too much at once in the past few months and trying to organise the relaunch of AffiliateFix with all its moving parts. We got there in the end, but it wasn’t without its drama as always! Andy and I were also invited to speak in our first ever public speaking event in London. It went brilliantly and we received some glowing feedback, which was great as we’ve never done it before. To throw on top of the above, November featured Black Friday, Cyber Monday and nearing the announcement and soft beta launch of “Project P”, so it was a month full of ups and downs but one that we managed to ride out on top of. So by now you should know – as I’ve mentioned in the previous month’s growth report – that affilinc Ltd is our new company name and brand, replacing its predecessor FixForums. It’s been a VERY busy month for the company as we’ve been working back and forth with designers, developers and the whole team to relaunch AffiliateFix. I’ll go into detail about the launch below as there’s lots to share that doesn’t get seen in public, but we got there in the end and managed to orchestrate a successful relaunch of the community. As I’ve always said, I’ll be 100% transparent with myself and my readers in these reports, so I’m going to share that we’ve been approached by a large listed company about a possible acquisition of the company. I’ve always said that I’d never sell this company unless it was the right fit for our members and the progression of what we’ve built, and I stand by that statement. Due to a VERY busy calendar at this time of year in the product launch space, we’ve pushed our launch of affkit back until the end of January when we can get the most exposure and participants in the launch as possible. I truly believe our customers will absolutely LOVE the new affkit, and it’s going to help affiliates all over the world make A LOT of money!…..A LOT! Over the next few months up until the launch, we’ll be focusing on building strong partner relationships and making affkit as good as it can possibly be before reopening the doors for a limited time. We did it, but not without some problems along the way! To keep this as short and simple as possible, we just relaunched AffiliateFix.com. However, this wasn’t simply a redesign. Oh, no! So as you can imagine, launch day wasn’t too fun. Basically, we had to create the finished site on a staging server, then migrate it over to the root domain, and then import 5staraffiliateprograms and WebsiteFix. This didn’t happen without its hiccups. Everything with the migration went very well; however, the import of 5staraffiliateprograms caused us A LOT of problems. The issue was that 5star was still on a very old and outdated version of vBulletin (sorry for swearing). Therefore, the import didn’t work the first time, but we only noticed this a few days after, meaning we had to redo everything we’d done on the style from a few days back and shut the site for longer than expected. Needless to say, this meant several back-to-back day and nights working constantly trying to make up time for our mistakes and a couple of 24 hours with very little sleep. I think this is what put me at the doctors! After 72 hours of constant work between our main designer and 3 developers, we finally announced we were reopening for business. You can read the full launch announcement here. So, was it worth it? The stress, the sleepless nights, the months of work…. As you can see from the above, although very early days, we’ve almost doubled daily sign-ups, posts and user activity. 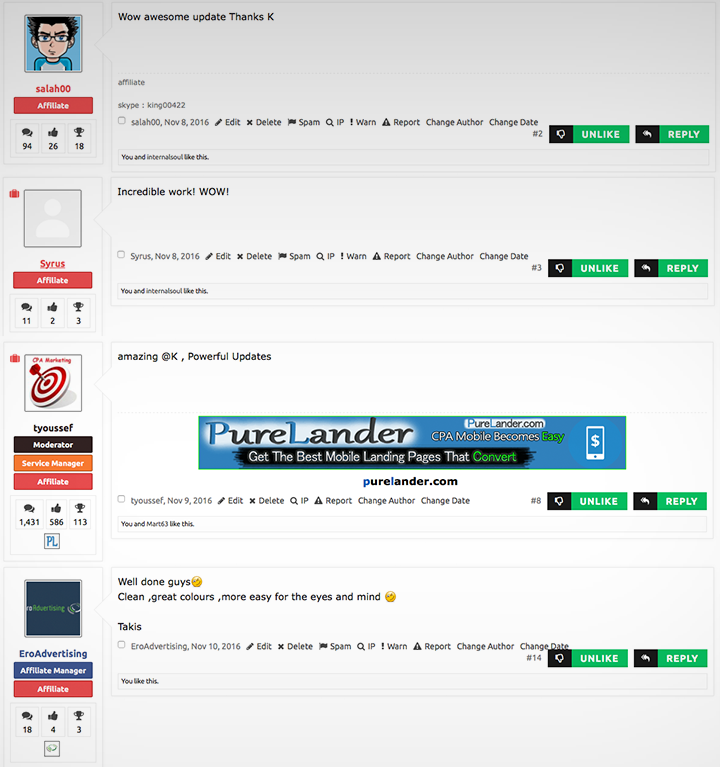 The feedback overall has also been incredible not just from our members but from the hundreds of companies that are represented on the forums. I can’t not mention Black Friday as it was again another huge success for us. We had an exclusive 50% sale on our user upgrades including huge savings for our new company upgrades, which sold very well over the weekend. We also ran an exclusive offer with the beloved AdPlexity for 50% off all their packages, which also went great and was received very well by our members! What an exciting month for us here at Landing Page Guys! Not only are we just a week away from announcing “Project P” and opening the doors for a soft beta launch, but we also experienced our first ever public speaking event. Thanks to GlobalWideMedia, Andy and I were invited to speak in front of 50-100 industry folk about how to build high converting landing pages. 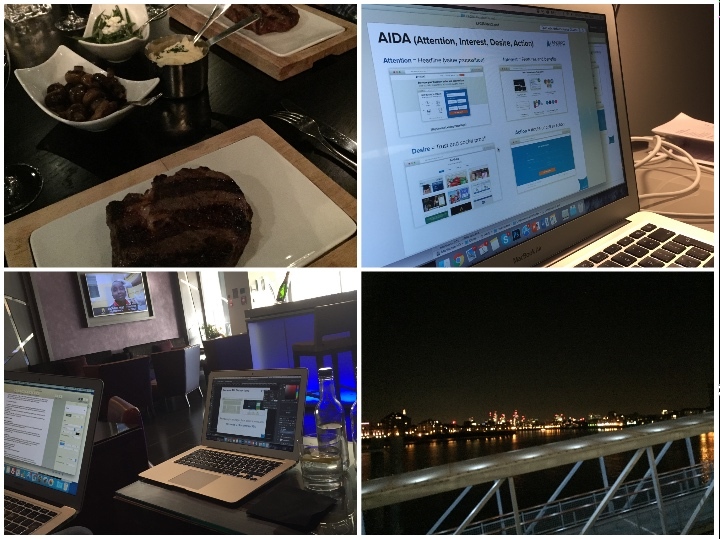 We arrived in London for the talk the night before and put the final touches to our presentation over a nice steak dinner at Gaucho. The following morning, we were up early for the commute to the venue as we prepared for our first ever talk. Funnily enough, I wasn’t in the slightest bit nervous even though this was my first time speaking in public. The talk went really well (we think), and we received some great feedback from entrants and the GlobalWideMedia Team. We also managed to record the whole event. You can now replay the video and download the slides here. 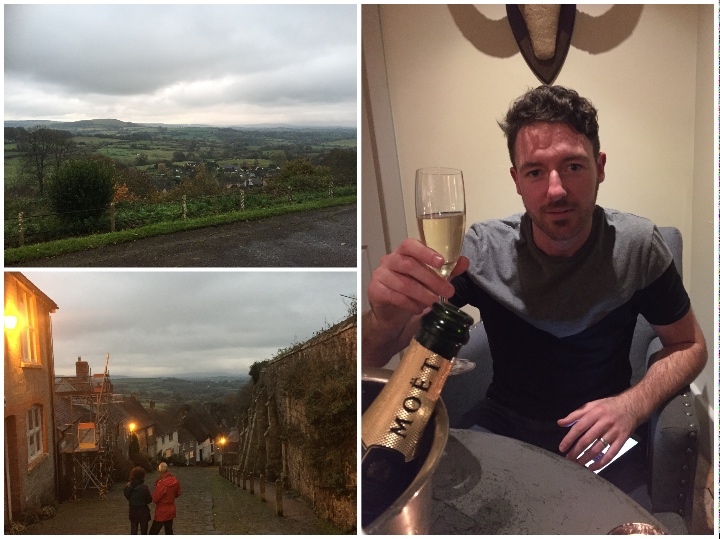 Aside from “work”, we also enjoyed a Directors Christmas trip away with our partners and dogs to a little town called Shaftesbury. As Andy and his wife are expecting their first child very soon, we decided to celebrate Christmas early this year so Andy could still enjoy an ale or three! The festive outings didn’t stop there though. We also enjoyed a little bar crawl and dinner with our good friend Matt Wood from PMI. We discussed business and the possibility of co-hosting an event in London next year. Watch this space! My worst month on the blog so far, and for that I apologise. I’m hoping I can be forgiven though. As you have read above, this past month has been a tad on the stressful side for me. On a side note, for those of you who read my reports each month, would you watch a video report? I need to up my social and video game, so I’m thinking of recording my reports each month also in a quick snappy update and posting them above the written reports. Who’d watch them? Comment below! So as I mentioned above, I struggled a little with my health in November, which isn’t good and isn’t like me, but I guess I subconsciously took on too much and it affected me. I’m feeling much better now though, so let’s hope it was a little blip as I’m not slowing down! I was lucky enough to be sent on another corporate/hospitality trip to my beloved Anfield and was fortunate enough to be able to take Josie with me this time. Thanks again to my amazing partners at InstaForex. 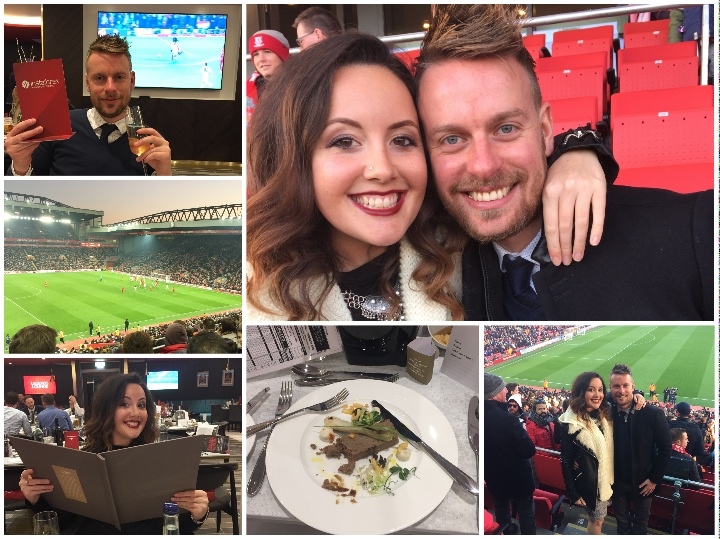 If you ever get the chance to go to Anfield on hospitality tickets, do it! The staff are incredible, and the whole experience is just out of this world! We also managed to pull a win out this time as we beat Sunderland 2-0. Oh, I got a new whip! 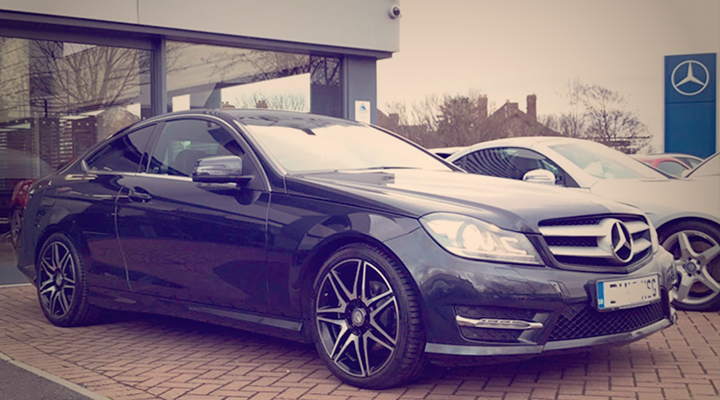 I decided to treat myself to a car upgrade and purchased a new Mercedes-Benz. So, a very stressful but ultimately rewarding November was had on this side. What did you guys get up to?